Stock 1957 fender eyebrow treatment. 1958 Ghias are actually 1957s. Shown here is a combination of three die cast pieces with a stainless steel cap. The inner molding near the hood, the outer molding that continues down the fender, the crown which is gold anodized and the stainless cap that joins it all together. The Ghia eyebrow was a hand made, two piece, brass work of art. It had studs silver soldered to the inside of it, and enameled Ghia badge, and a gold plated crown. It covered the entire front of the fender and then the side molding, which was similar to the factory side molding (but hand made out of brass), extended down the fender. The eyebrow has a similar appearance to the 1958 stock Imperial trim. The side molding looks exaclty like a 1958 piece, but it is not. It has been stated in pervious articles that the cars were designed in America, but one wonders if trim pieces like this were designed by Ghia and facimilies were later adopted for production. 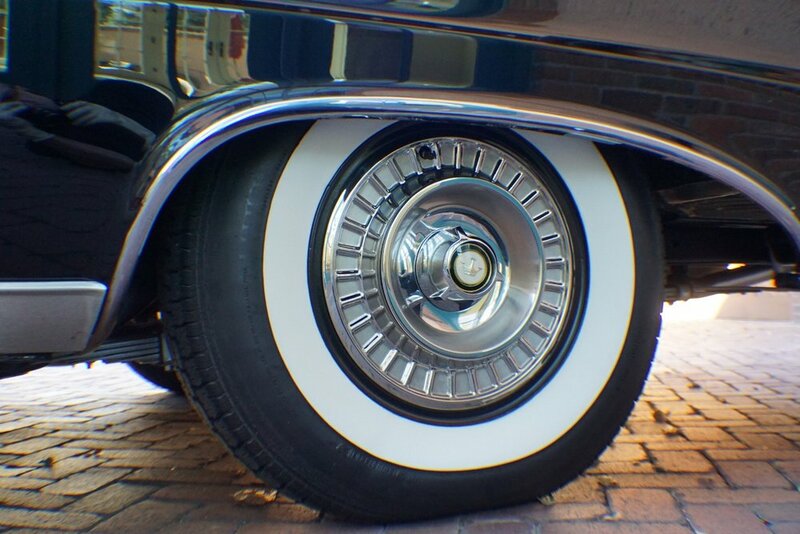 Chrysler Imperials in 1957 and ‘58 did not have wheel opening moldings. The ones from Ghia were beautifully produced, individually numbered and actually quite heavy to handle. Once again, made from hand hammered brass another example of the true metal crafter’s art. Also pictured is a view of the beginning of the right rocker panel molding. These were actually made from cast brass, weighed a ton, and were screwed directly through the center of the molding into the rocker panel. They were wavy and didn’t have the best appearance. So in the restoration process we build ones out of stainless steel and attached them with invisible clips. 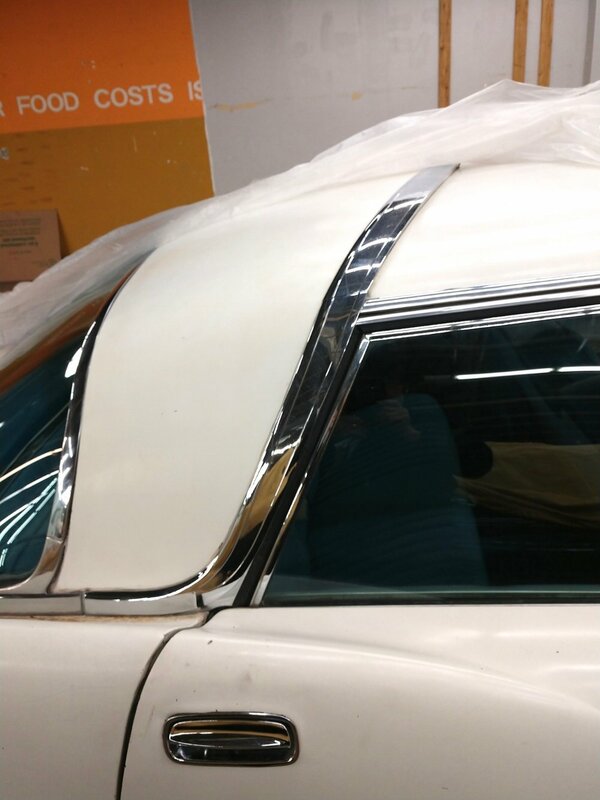 Along with the intensely better paint prep, the refining of the gaps and the hiding of spots welds with lead, they capped off the hood with a bird backer. The bird is actually stock Chrysler. The gold plate behind it is hand made Ghia and production numbered. Chrysler later adopted this gold plate highlight method for the factory build LeBarons. Numbered bird backer. 62 is our Ghia production. The other number is a mystery as it appears on none of the other stamped pieces. It has the same 7 digits as a standard Imperial serial number, however with no alpha prefix or 57 designation. Virtually all of the exterior trim was hand made out of brass. To produce this particular piece, the rear window exterior molding, 16 different pieces were bead rolled and then welded together. Finally, studs were silver soldered in place to install it to the vehicle. Other custom exterior trim pieces include the front fender eyebrow and side moldings, the fender wheel opening moldings, the rocker panel moldings, the windshield header molding, all of the side window surround moldings (both the interior and exterior), the over the rear roof band known to me as the “tiara”, the horizontal rear fin spear chrome accents, the tail light halos and trim rings, the rear trunk bird, the gold plate under the trunk bird and under the front bird, and finally rear bumper garnish plates. This exposes one of the dirty little secrets of Ghia. Despite the fact that the opening is hand made, the glass is hand made, and the molding is hand made, the rubber is actually the 4 hacked out corners of a windshield gasket as supplied by Chrysler. They are then butted together and glued. The “tiara” is a handmade band that runs over the top of the roof, down the rear most pillar, and around the base of the back window. It mimics the stock piece that came on the hardtop Imperial, but none of it was produced by Chrysler. It beautifully surrounds the rear padded roof and comes to a “forward look” point in the center of the roof. It’s made of brass, stamped with the production number of the car, is attached with a combination of T-bolts and soldered in studs. The center of it is accented with the body color of the car. All articles that I’ve read indicate that the padded top was leather. Vinyl roofs were incredibly uncommon in 1957 and were part of the Ghia’s allure. 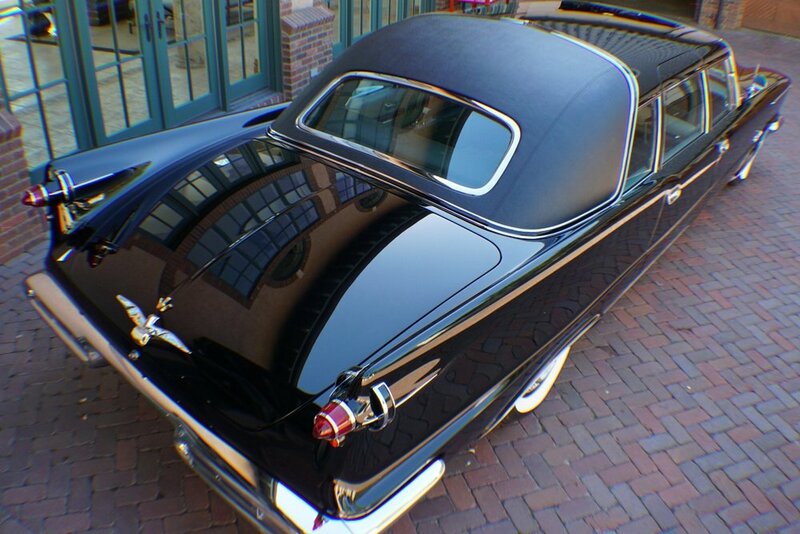 Even Cadillac did not offer a vinyl roof option until 1960. However, in all the unrestored Ghias that I have observed, the roof is made of vinyl, not leather. Like the Ghia factory, all of the moldings were copper plated and hand fit before chrome plating. Also, as with every other vehicle specific parts all of the 5 Ghia pieces were marked with the production number 62. Stock ‘57 “tiara”. In other articles, this rear section of roof is described as being grafted onto the new Ghia roof. As you can see from the photos, the new roof is much larger than the stock piece. I have found the entire roof to be Ghia made. The roof, which is entirely handmade, bubbles for greater rear headroom rear of the “tiara”. The molding and the padded roof hides that completely. The original tiara halves simply butted together on the roof. The cap pictured was custom made by us for a better finish.